Got a replacement bank card in the mail today with PayPass. For those interested, here is my letter I sent to Westpac this morning! Your current Westpac Debit MasterCard is due to expire at the end of the month, so we’re plaesed to present you with its replacement which now includes the security of CHIP technology and the added convenience of the latest in contactless payment technology. As an IT student and developer with experience in wireless technolgies, I have informed and severe reservations about bank cards with embedded antennas, let alone one that’s tied to my daily checking account. I would like to request a new replacement card without the SmartPay antenna, as you issued me with previously. Otherwise, I suppose a delicate scalpal job to sever the antenna from the CHIP may be in order. 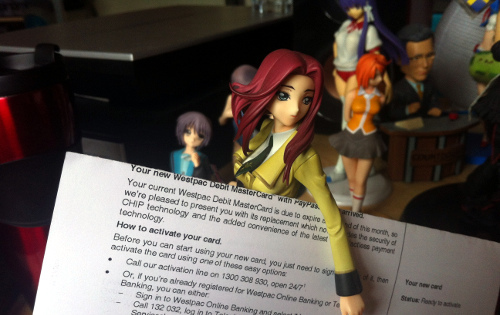 For some reason I got into the habit years ago of using Kallen to hold legal letters. I think it started with this in 2009! Newer post ← Would you give an ARM for an Intel phone? Older post → Ruben studies UML, again!